Minimal Government Thinkers, Inc. has a joint project with SEANET, the regional free market think tank based in Kuala Lumpur, to promote free trade and market reforms in the ASEAN countries. This is the first of the many public education activities that we will undertake. 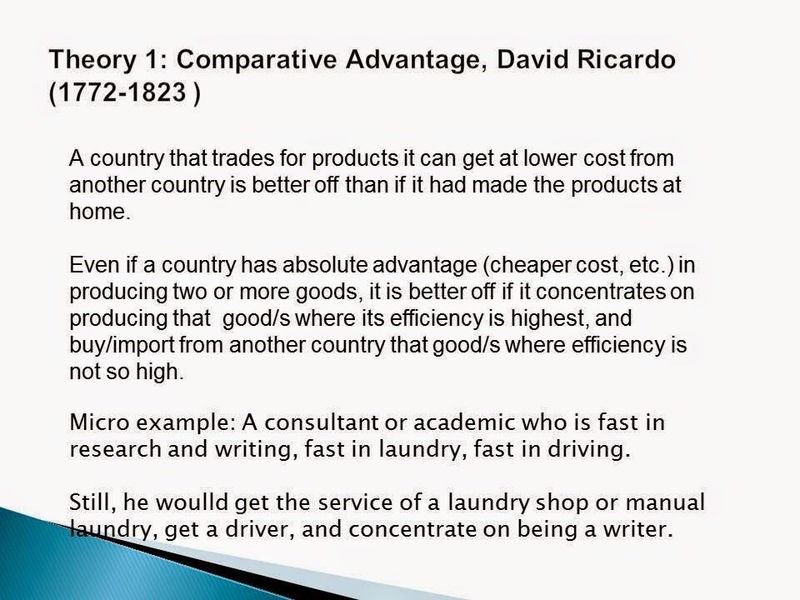 The first known theoretician to articulate the theory and beauty of comparative advantage was the British investor and later, political economist, David Ricardo. After reading Adam Smith's "The Wealth of Nations", he was enamored with classical economic theories and studied and wrote on his own. When goods and services are allowed free mobility with zero restrictions, all other things being equal, CPE will occur, even temporarily. Or the price difference among similar or homogeneous products and services will be low. Free mobility of people and services across countries and continents will result in FPE over the long term, all other things being equal. Countries with expensive labor due to labor deficit and low population will experience decline in labor cost once additional and competing labor of similar skills from abroad come in. And countries with cheap labor due to high supply of workers, high population, will experience increase in labor cost once the excess labor goes out and work abroad. 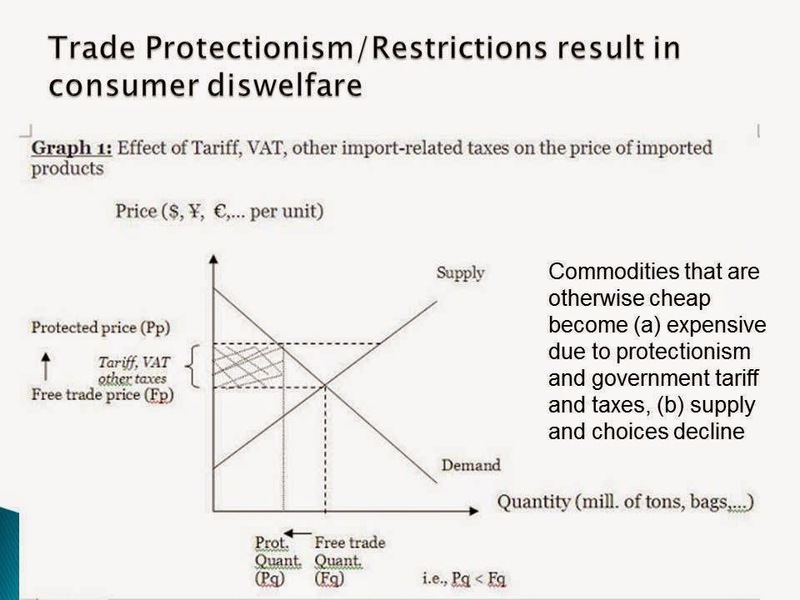 The purpose of slapping import tariff and taxes is to make otherwise cheap goods from abroad to become expensive. This is one of the lousiest philosophies and policies of many governments around the world, while trumpeting that they "care for the poor". 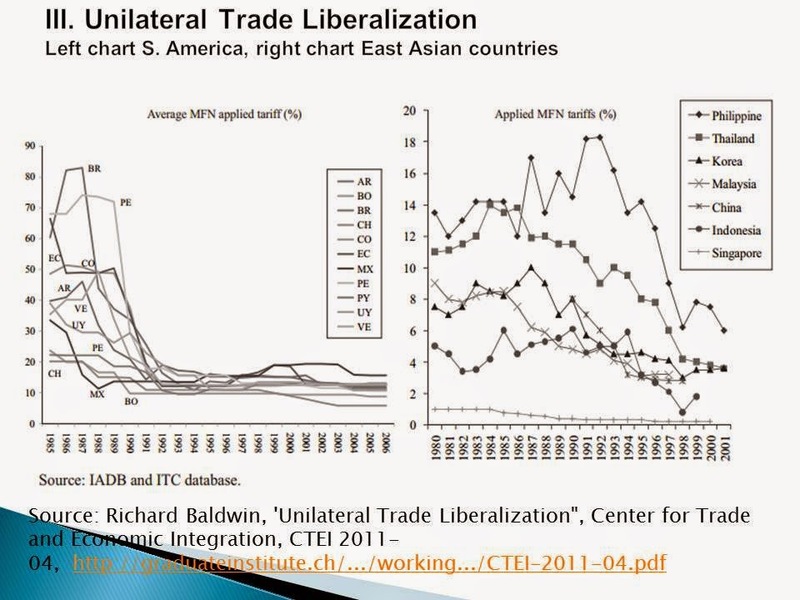 Countries in East Asia are leaning towards unilateral and regional trade liberalization compared to their counterparts in S. America and Africa. When it comes to agricultural products though, many economies become protectionist. These were my concluding notes. Photo taken by Lee, one of the students in the class. Thanks Lee. 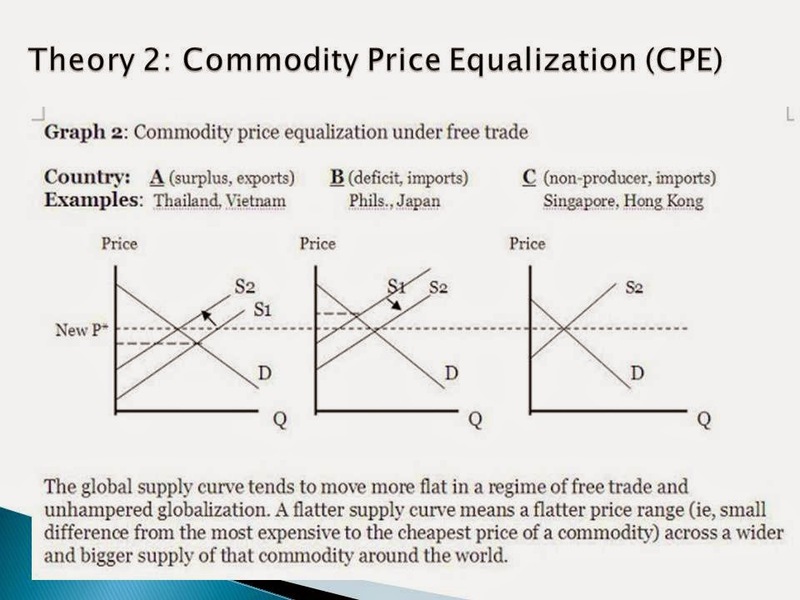 * Free trade means free enterprises, free individuals. 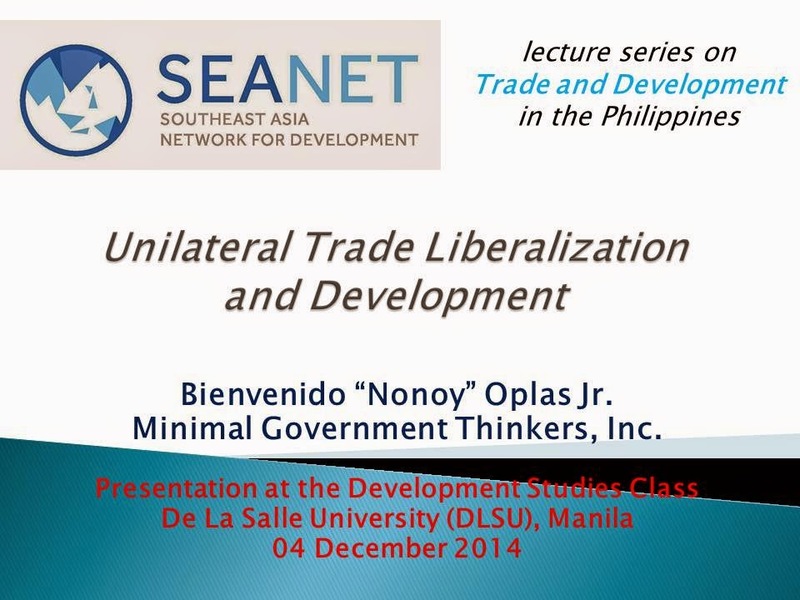 Restrictions to trade is restricting potential economic development. * Governments should reduce restrictions on people and goods mobility. 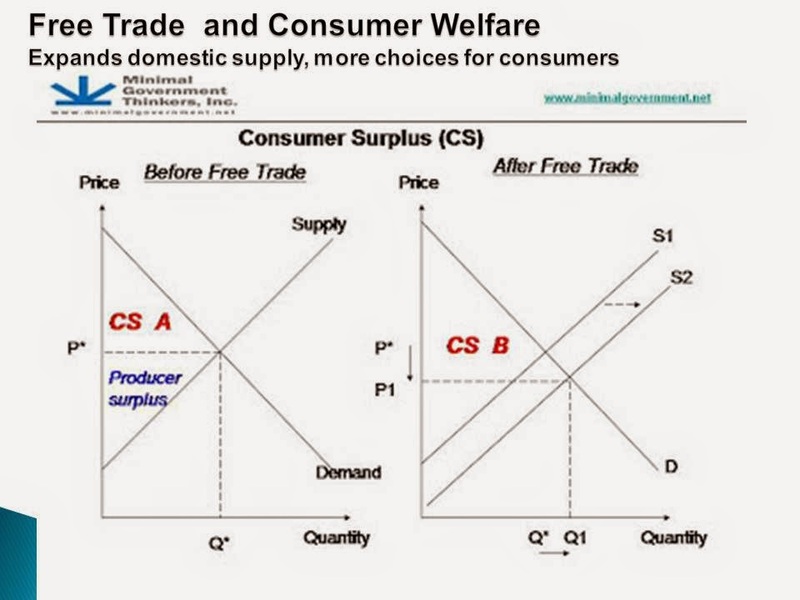 (a) reduceg tariffs and non-tariff barriers (NTBs) like customs bureaucracies; (b) simplify visa requirements and issuance, reduce the cost of migration; (c) focus on rule of law function, go after real criminals and not ordinary migrants who only wish to improve their condition through hard work. 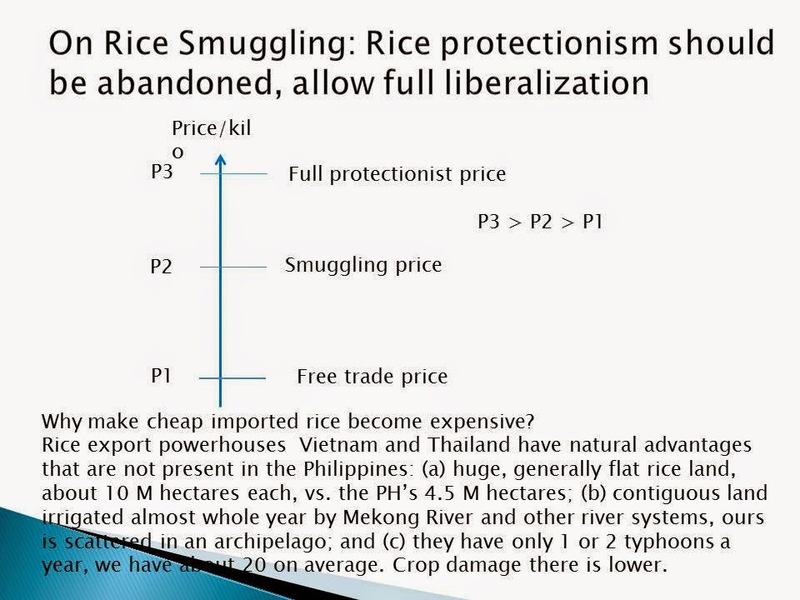 * Smuggling can be beneficial to consumers in the form of lower prices compared to protectionist prices. But this expands corruption in government. No to protectionism, no need for smuggling, just abolish trade restrictions. * Unilateral liberalization – no need for or minimum of negotiations, just open the borders at zero tariff – is pro-development. No regulations except bringing in or out of guns, bombs, poisonous substances, other products that are threat to public health. 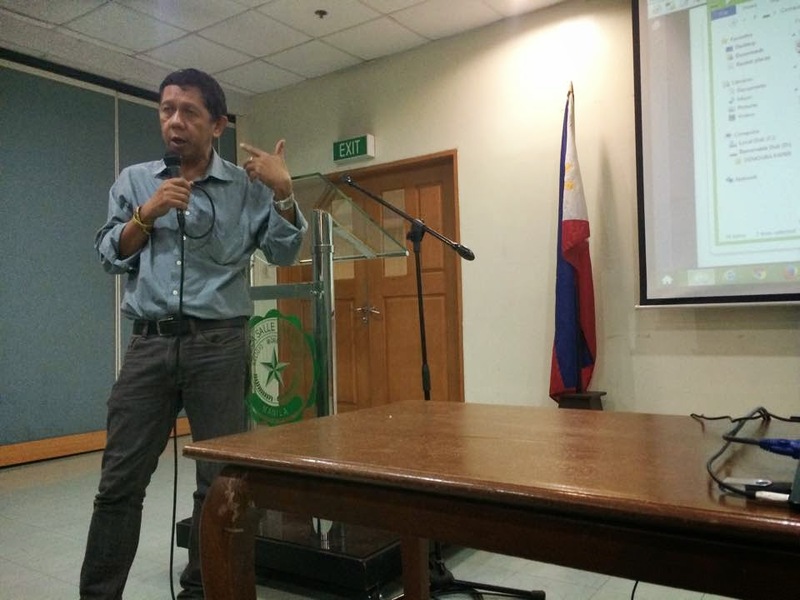 * Protectionist PH constitution should be amended to allow more foreign investments and competition.